To celebrate his fiftieth release, Dronarivm releases a work conceived in 2013 for a dance piece by Iván Pérez called "Hide And Seek". As I believe that there's no need to introduce neither Aaron Martin nor Machinefabriek, I will go straight to the musical point: the interaction between the instruments, mostly cello, played by Martin and the electronics played by Zuydervelt. The music could be roughly classified as glitch or modern classical in respect to what is considered to be real center of interest or writing. The canonical glitchy opening of "Wake" introduces the listener in a framework which is immediately reversed by "Wings in the Grass" rounding around a romantic cello melody. As "Arms Turn Slowly" develops there's a movement from abstraction to the song introducing a quiet piece as "Leaves Are Swimming" reminding the quietest moments of Machinefabriek's discography. "Hidden" is a minimal ambient interlude to the second part of this release. 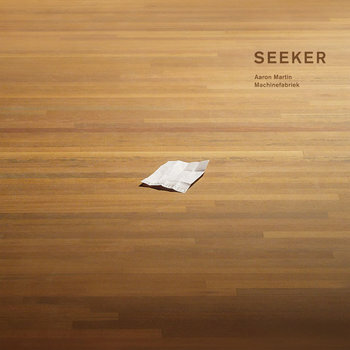 "Seeker" is an hook to the tradition of dance music with his evocative cello melodies while "A Small Crowd Points" and "Close to Dark" evolves around drones, focusing on sound details. The voice of Aaron Martin closes this release in "Buried Cloth" creating something similar to a sense of peace. While it doesn't sound as a simple accompaniment for a ballet, it has a sense of completeness that doesn't need a visual counterpart. Perhaps this couldn't be exactly a virtue for a music conceived with a precise objective but it's surely best for the listener. Another example of clear talent. As its previous "Hijra. 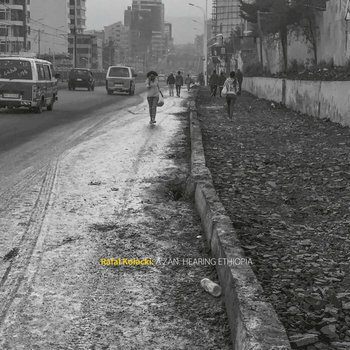 Noise from the Jungle", this new release by this Polish artist is a set of field recordings; they were made in Addis Abeba and this city was chosen as there are many different languages and different forms of religious activity. So, there's again a cultural and political concept in this recording: the possibility of coexistence of different cultures in the same place. As the first seconds of "’zan" are heard, the listener is immediately placed in Ethiopia, and there's an audio feeling of a postcard, as there's the sound of the environment, more precisely bird's singing, along with the recording of a song from the radio or tv. As the release develops, it's clear how there's any interest in documenting the musical scene of the place but to capture the sound of everyday life. While there are anyway tracks like "’gar" devoted to the music of this place, it's mostly, if not entirely, singing as if they were recorded from a religious rite. Instead, as in "R... 's", music emerges as a phenomenon as just another sound i.e., a clacson, and where is completely absent, as in "Ab", there's a perceptible evocation in the recordings. So, as the of voice of "Faras" end his chant, and the release, there's a sense of a journey's end. Absolutely impressive in his ability to capture the soul of a place, it's completely different from the typical release of field recording more concerned with the precise audio details; so it's absolutely necessary. Four-piece Langham Research Centre’s “Tape Works vol. 1” is an unashamed revelling in the classic sounds of 60’s and 70’s electronic experimental music. Analogue oscillating bleeps, tape stops, short detached vocal snippets and groans, classic everyday found sounds like creaking doors and old-fashioned telephone noises run through vari-speed effects and playful percussive sounds abound across 11 fairly quirky, but not actually out-and-out comic, audio fiddlings. They rightly credit the inspiration of Delia Derbyshire and Daphne Oram in an album that sounds like it could’ve been dusted down from a BBC vault unopened since 1971, instead of being a recent set of composition. Many of the tracks even have that soft cassette hiss underpinning them for extra authenticity. A track title like “LOL” seems anachronistic then, on perhaps the weirdest piece were monkey laughter is looped and layered into something very tripped out. “Sink Speeds” and “Executive Balls” stand out as notably different sonically due to the much heavier use of old documentary narration and car adverts with rough cutting which results in something much more akin to the raw collation of 80’s Negativland releases. Several of the tracks are much more conventional in their layout though, with “Roadside Picnic”, despite its title, an example of an interesting take on putting spontaneous metal and percussive noises through a mangler to create something dynamic and awkward that you just can’t help but want to follow. The prosaically-named creaky sound of “Doors”, wobble-heavy “Nudge” and longest piece “Quaser Melodics” delve into deeper, sparser territory, with some of the atmospheres allowed to breathe a little further and more consistently. There’s a definite sense that it was fun to take it seriously when evolving this release. But for the haircuts even the artwork wants in on the retro feel that’s very well realised here. If you’ve played your old Radiophonic Workshop LP’s to death then here’s a sound-alike you’ll definitely appreciate. 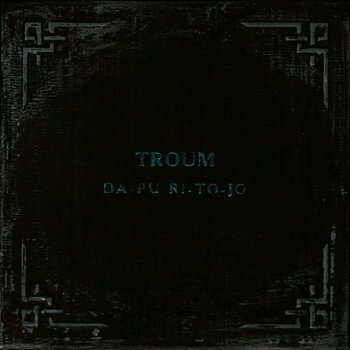 This new release by Troum is a a collection of 7" vinyl release, from 2004 to 2016, and it's introduced by a short script by the band where the overall concept is that this release could work as a description of the project. Their music could be roughly described as dark ambient but this release shows how they are able to wander across all variations of the genre. "Segeler" is a crescendo of quiet drones, "Un / Mahts" is an almost monolithic mass of noises but with a movement. The last two track are from a digital only release and are the newest tracks: "Victoria" and "Unreleased Theme For River Endscene" reveals an idea of dark ambient where the drone is just a background for certain musical element to emerge. As a release from a band classified as dark ambient, or post-industrial, this release reveals a band who search a musical way to express their ideas rather than repeat a formula on every track. Recommended. “Intervivos” is a collaboration, bordering on a collision, between Gionnet’s impulsive alto saxophone improvisations and Yoshikawa’s instant feedback, resampling, sustained and electronic reprocessing. It’s a fierce and raw-edged affair in which high screeching tones and dischords are stretched, mangled and tortured. Long notes end in abrupt flurries of playing interspersed with silences and subtle drone sections built to throw the intentional awkwardness of the arrangements into sharp relief. Impulsive light percussive sounds are sprinkled lightly around to offer a form of counterpoint to the impossibly long sax breaths, sometimes looping and retriggering into an imitation of rhythm. Across four pieces that are numbered not named, and across 44 minutes, there are plenty of truly nails-down-a-blackboard moments- but it’s not entirely relentless. The latter sections of piece 1 develop a form of slowly evolving suspense where a sudden change of base note feels like real drama. In piece 4 there are sections that are sparser and feel like more traditional avantgarde jazz (accepting that contradiction in terms), deeper and strangely warmer notes- twelve minutes in being a dynamic highlight. For the most part though this is a seriously challenging wall of noise to befuddle and overwhelm you. Wallow in it and get transported to very strange mental places indeed, or listen to it without concentrating and think “to be honest that just hurts my ears”.